Everyone knows driving drunk is a no good, very bad idea. But one Alaska town wants to take that a step further — or actually, it doesn’t want tipsy people taking any steps, and instead wants to ban drunk walking. Jokey headlines aside, the city doesn’t want drunkards just stopping and dropping, but taking one of the city’s 75 cabs. KYUK.com reports on the ordinance amending the city’s public decency laws, wherein the Public Safety and Transportation Commission introduced a few tweaks to the public decency laws. The amendment would prohibit drunkenly strolling city streets or ice roads. 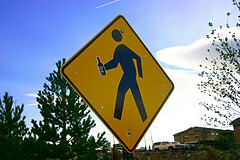 Another council member says he’s not in total agreement with the drunken walking prohibition. “I can’t support that particular section. I understand people can be a menace, but there’s other ways to handle it than outlawing drunk walking,” he said. But another council member thinks it’s a grand idea, pointing out the 75 cabs running in the city and designated drivers. And also? It gets really cold in Alaska, like 40 below, so anyone walking on the road in that situation is going to be in danger, much less if you’re hammered. The city council ultimately voted to introduce the ordinance, which means it’ll still get discussed at future meetings. No one better waltz in with a bottle of whiskey, that’s for darn sure.